Based on the virtually unlimited profiles that can be created, the MAAPS navigator is displayed providing the User with countless options to see and group data, based on their security protocol. Columns can be sorted & filtered in up to 8 ways plus these can be done in multiples. Columns can also be moved to any position and /or be pinned to left side of the report. Columns are "Totaled" at the bottom based on the data that is displayed and/or filtered. Every time the filter is changed, the totals change. Because MAAPS is web based, the Navigator is available to users, based on their respective defined security protocol, 24 hours a day, 7 days a week, from anywhere in the world. 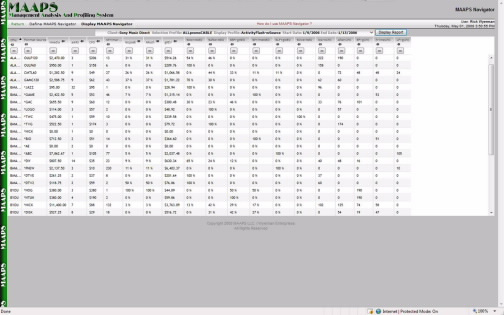 MAAPS Navigator allows secured users to select any number of data groupings, from up to 150 predefined columns of data, to analyze any trend for any period of time and at any level of detail. 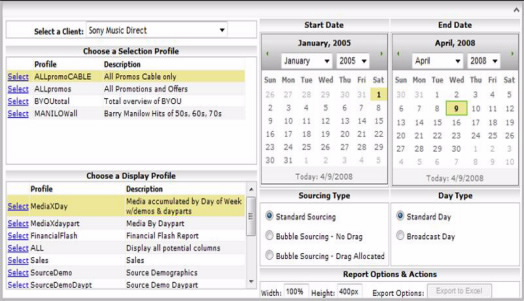 MAAPS Navigator provides virtually unlimited ways to group and display data as well as find, sort and filter data for specific trends & analyses, each of which is exportable to excel.